Weeks ago, the military disclosed the “Red October,” a plot to destabilize the Duterte administration. There were names dragged and even alleged schools infested with communist recruits. Red October is said to create havoc and oust Duterte, according to intelligence. Today, former Davao Vice Mayor Pulong Duterte bare the names and business organizations that are allegedly conniving to oust President Duterte from the presidency. 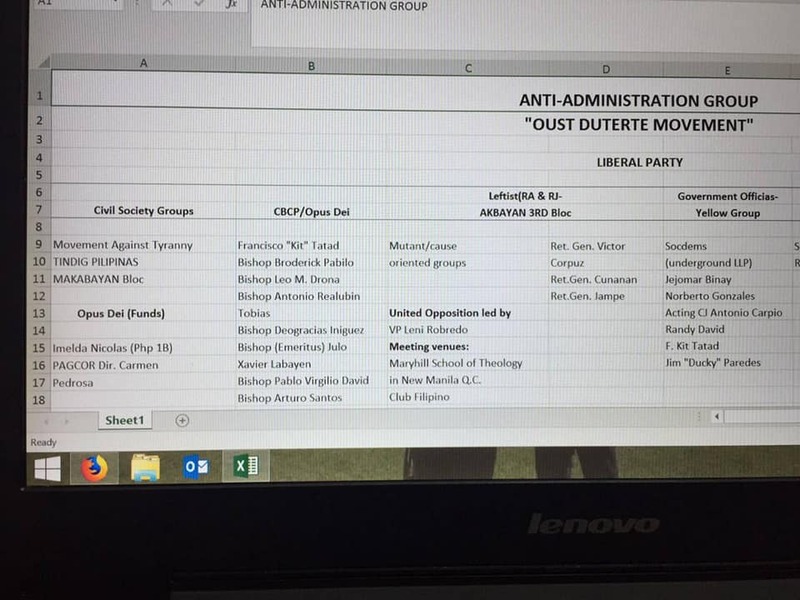 In his Facebook page, he posted screencaps of excel sheets containing the names that are familiar and not surprising to many. 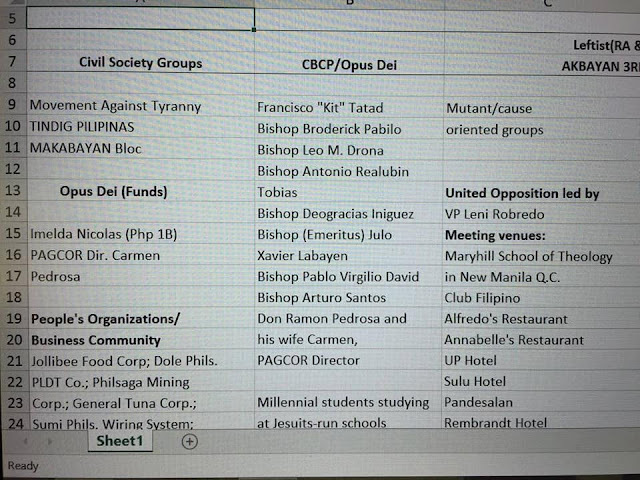 Society groups mentioned are Tindig Pilipinas, Movement Against Tyranny, and the Makabayan Bloc. 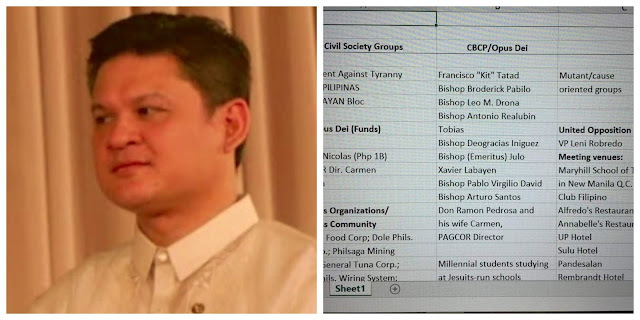 There were names of bishops under the CBCP. In the business community, Jollibee Food Corp, DOLE Phils, and PLDT ring a bell. Retired generals from Akbayan 3rd bloc are mentioned too. Added to that, Jejomar Binay, Jim Paredes, Norberto Gonzales, Acting Chief Justice Antonio Carpio, and Francisco Kit Tatad belongs to the list. People won’t be surprised at all to see media people on the controversial rundown bearing Maria Ressa and Rappler, Ellen Tordesillas, and Ed Lingao. 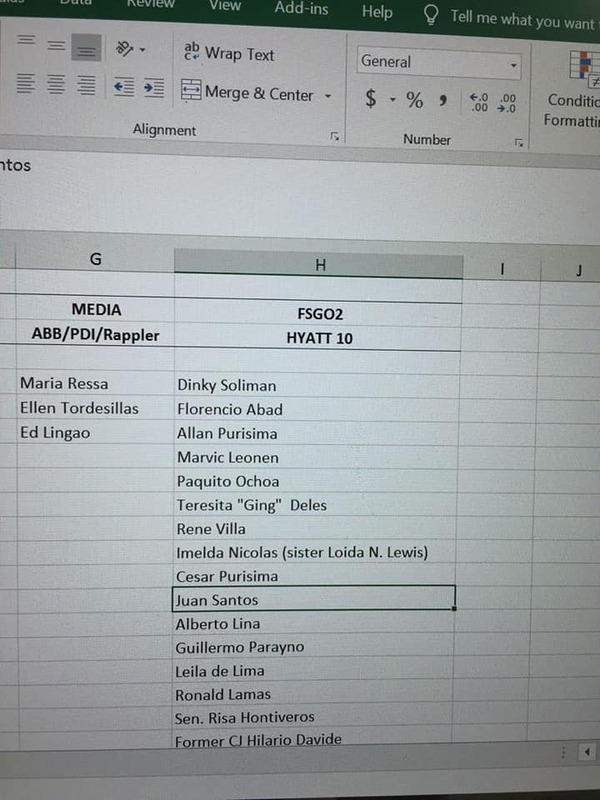 The Hyatt 10 where Risa Hontiveros belongs, Dinky Soliman, Florencio Abad, Leila De Lima, Former CJ Hilario Davide, and many more. From the United Opposition, VP Leni Robredo takes the spot. 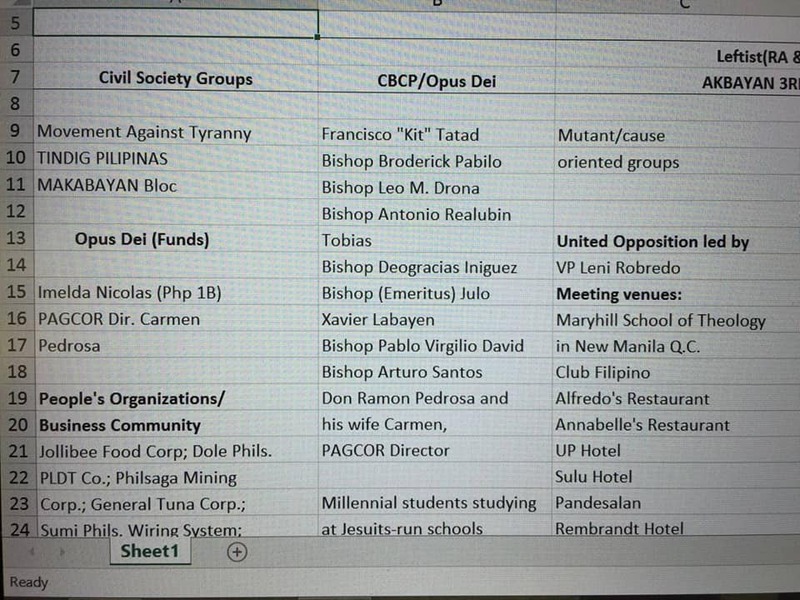 Pulong Duterte did not just reveal the names but the group’s rendezvous too. They often meet in particular places such as Rembrandt Hotel, Annabelle’s Restaurant, Club Filipino, Pandesalan, Sulu Hotel, and UP Hotel. They even meet in a school specifically at Maryhill School of Theology in New Manila, Quezon City. The former Davao Vice-mayor did not divulge the source of information but is confident enough to bare it to the social media. The list was posted few hours after the victorious result of his libel case against Senator Antonio Trillanes IV. He was accused by Trillanes as a part of a drug syndicate.